When you are suffering from kidney stone, you need to drink plenty of water. Make sure you are drinking sufficient water every day to keep your body and kidneys hydrated. When you consume ten glasses of plain drinking water along with other kinds of fluids, the color of your urine will become clear like water which is a good sign. It is recommended to drink good water as it is free of sediments. good water intake will help in reducing the concentrations of calcium and uric acid from the urine, thus making it less alkaline in nature. At the same time good water intake will not allow the kidney stone to increase in size. In comparison to other types of vegetables, watermelon is packed with potassium salts. Moreover, it is made up of high water content that helps with hydration. Juice The citric acid present in lemon helps to break down the calcium-based kidney stones and at the same time stops the further growth of such stones. Two to three times a day drink a glass of water with a few drops of lemon juice. When you drink lemonade, the volume of urination will also increase which is really good for those having kidney stones. Else you can mix one tablespoon of lemon juice with one tablespoon of pure honey and drink it with half glass of water. After half an hour add the juice of half lemon in half glass of water and one tumbler of sugar cane juice and drink it. Juice without the seeds of pomegranate can help in the treatment of kidney stones due to their astringent properties. Try to eat one whole pomegranate daily or else drink one glass of freshly-squeezed pomegranate juice. You can eat this fruit in the form of a fruit salad also. Take cup of horse gram soup once daily. 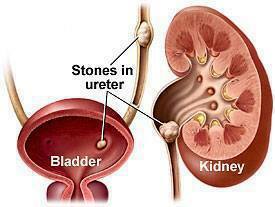 This remedy will help in dissolving the gravel in kidneys. everyone knows well that barley is good for expulsion of stones. because of its diuretic property. homoeopathy medicines are more useful to remove stones without pain.